Chris Evans leads the all-star cast of Song Kang Ho, Tilda Swinton, Jamie Bell, Octavia Spencer, Ewen Bremner, John Hurt, and Ed Harris The director is Bong Joon Ho. After a failed global-warming experiment, a post-apocalyptic Ice Age has killed off nearly all life on the planet. All that remains of humanity are the lucky few survivors that boarded the Snowpiercer, a train that travels around the globe, powered by a sacred perpetual-motion engine. A class system has evolved aboard the train, fiercely dividing its population--but a revolution is brewing. BEVERLY HILLS, CA - Anchor Bay Entertainment and RADiUS are proud to announce the home entertainment release of the post-apocalyptic thriller, Snowpiercer . Chris Evans leads the all-star cast of Song Kang Ho, Tilda Swinton, Jamie Bell, Octavia Spencer, Ewen Bremner, John Hurt, and Ed Harris. Visionary director Bong Joon Ho's "enormously ambitious and visually stunning," (Scott Foundas, Variety) film has been widely praised as "a superb masterpiece of science fiction" (MTV). RADiUS released the film theatrically on June 27, 2014. A box office success, the film has amassed $4.4 million to date, making it one of the top ten highest grossing independent films of the year. The sci-fi epic, hailed as "a singular and breathtaking cinematic experience," (TwitchFilm.com) will be available on Blu-ray(TM) and DVD October 21, 2014. 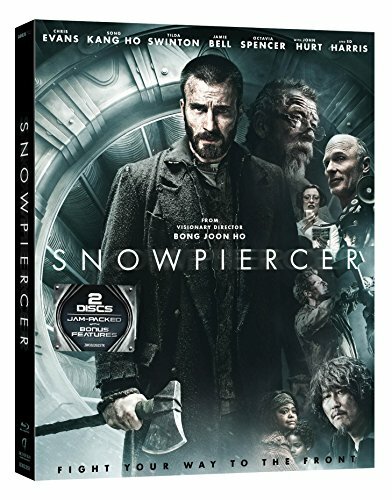 Snowpiercer has a running time of 126 minutes and is rated R for violence, language and drug content. Blu-Ray(TM) and DVD special features include a Critics' Commentary hosted by Scott Weinberg and a second disc jam-packed with special features comprised of The Birth of Snowpiercer, The Characters, Animated Prologue, Concept Art Galleries, Chris Evans & Tilda Swinton on Snowpiercer, The Train Brought to Life: Behind the Scenes of a Special Screening, and TRANSPERCENEIGE: From the Blank Page to the Black Screen. RADiUS is the boutique label of the Weinstein Company (TWC) and the first studio division dedicated to both multi-platform VOD and theatrical distribution. Utilizing both traditional and digital media, RADiUS-TWC brings the highest quality films and other specialty entertainment to a wider audience than ever before. Founded and led by Tom Quinn and Jason Janego, the label continues to develop innovative distribution strategies to make marquee content available to consumers where, when and how they want it. The label's inaugural slate included such films as BACHELORETTE (the first multi-platform film to hit #1 on iTunes and the only multi-platform release to ever reach #4 for top Cable VOD performers) and Cannes competition entry ONLY GOD FORGIVES directed by Nicolas Winding Refn and starring Ryan Gosling and Kristen Scott Thomas. Recent releases include: Morgan Neville's Oscar winner 20 FEET FROM STARDOM; Rob Epstein and Jeffrey Friedman's LOVELACE; Zachary Heinzerling's Oscar nominated CUTIE AND THE BOXER (Sundance 2013 U.S. Documentary Directing Award), Jacob Kornbluth's INEQUALITY FOR ALL (Sundance 2013 U.S. Documentary Special Jury Award) and Keanu Reeves' directorial debut - MAN OF TAI CHI in which he also stars. In 2014, RADiUS' slate features (among others): Bong Joon Ho's runaway hit SNOWPIERCER, BLUE RUIN (winner of the FIPRESCI International Critics Prize at the Cannes Film Festival), Errol Morris' THE UNKNOWN KNOWN, FED UP from Laurie David and Katie Couric, THE ONE I LOVE starring Elisabeth Moss and Mark Duplass (Sundance), Alexandre Aja's HORNS starring Daniel Radcliffe (Toronto), Berlin titles: EVERLY (Salma Hayek), WHEN ANIMALS DREAM, and PARADISE LOST (Benicio Del Toro) as well as two time Tribeca Film Festival winner KEEP ON KEEPIN' ON and BEYOND THE BRICK: A LEGO BRICKUMENTARY. The company is embarking on a CREEP trilogy alongside the Duplass brothers and Blumhouse Productions after the film's highly praised SXSW premiere and recently announced it had acquired SXSW Grand Jury prize winner THE GREAT INVISIBLE. Anchor Bay Entertainment is a leading home entertainment company. Anchor Bay acquires and distributes feature films, original television programming including STARZ Original series, children's entertainment, anime (Manga Entertainment), fitness (Anchor Bay Fitness), sports, and other filmed entertainment on DVD and Blu-ray(tm) formats. The company has long term distribution agreements in place for select programming with AMC Networks, RADiUS, and The Weinstein Company. Headquartered in Beverly Hills, CA, Anchor Bay Entertainment has offices in Troy, MI, as well as Canada, the United Kingdom and Australia. Anchor Bay Entertainment (www.anchorbayentertainment.com) is a Starz (NASDAQ: STRZA, STRZB) business, www.starz.com.